P4-MAX is a rich blend of powerful antioxidants and polyphenols, combined into a unique formula to complement an active lifestyle. 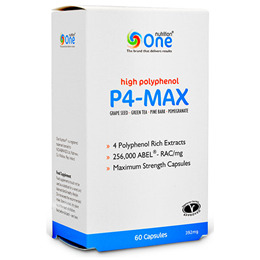 P4-MAX has been scientifically formulated to ensure of synergistic, antioxidant benefits. There are 4 polyphenol rich extracts: grapeseed extract, green tea, pine bark, pomegranate. NLT-400® (Extracts of: Grape Seed [95% OPC], Green Tea [95% Polyphenols], Pine Bark [95% Ortho-Cyanidin], Pomegranate [50% Ellagic Acid]), Organic rice flour (filler). Capsule shell: Hydroxypropyl methyl cellulose. Take 2-3 capsules daily, with food. 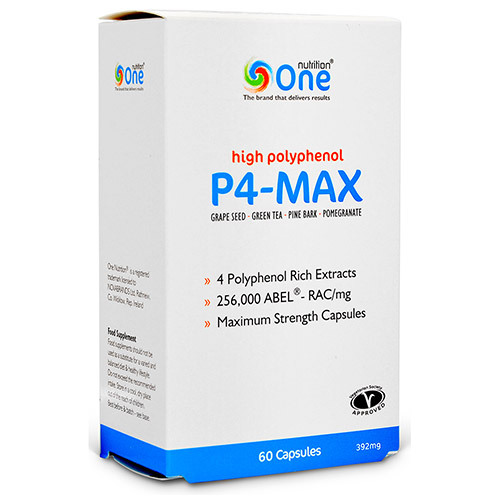 Below are reviews of One Nutrition P4 Max - High Polyphenol - 60 Capsules by bodykind customers. If you have tried this product we'd love to hear what you think so please leave a review.